Tomorrow, August 2nd, is National Coloring Book Day! Okay, let’s be honest… have you ever heard of National Coloring Book Day? Me neither. But at least now I know it’s tomorrow! But wait, you might say… color by number exercises give children defined colors and limits… why would this support creativity and imagination? Well, if you have children who don’t naturally want to draw or color, or feel timid doing so, color by number exercises offer a “safe zone” that kids can use to practice working with color and design. This can lead to future drawing, painting, or coloring activities. Granted, not much of a mystery. But when you see a blank color by number page, you don’t know what it’s going to look like before you color it in. As you color, the pictures start to come to life beneath the tips of your crayons. It’s fun to watch it happening. There are also color by number pages out there that do not allow users to see what the pictures are before they are colored… they often feature strange looking mosaics that “hide” a picture in the various shapes on the page. These are also fun classroom activities to complete. For younger students, coloring “between the lines” helps to build fine motor skills in the hands and fingers. It helps with children’s dexterity, hand-eye coordination, and skills with manipulating tools. This is not as much of a benefit for older kids, but it is definitely something the younger kids should practice. This will eventually lead to future skills with writing letters and writing in cursive. Color by number pages are a good way to teach color theory to children. Initial color by number pages can introduce colors like red, yellow, blue, green – the primary colors and secondary colors. Later color by number pages can introduce more complicated colors like magenta, cerulean, and amber. 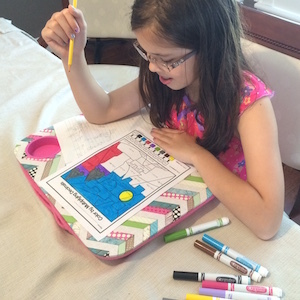 Color by number pages can help introduce kids to fine arts. Coloring is a relaxing activity. If you have hyper kids coming in from recess or lunch period, you can calm them down by giving them a color by number printable to work on. Once they’ve finished their work, they will be more ready to learn more demanding course material. While coloring by number, kids hone in on a task, and then focus on specific colors, numbers, or shapes while coloring in their coloring pages. This helps to build skills in focus and concentration. It also gives them a specific task to complete with a number of procedural steps to follow. Color by number pages do not have to be “integers only” pages. 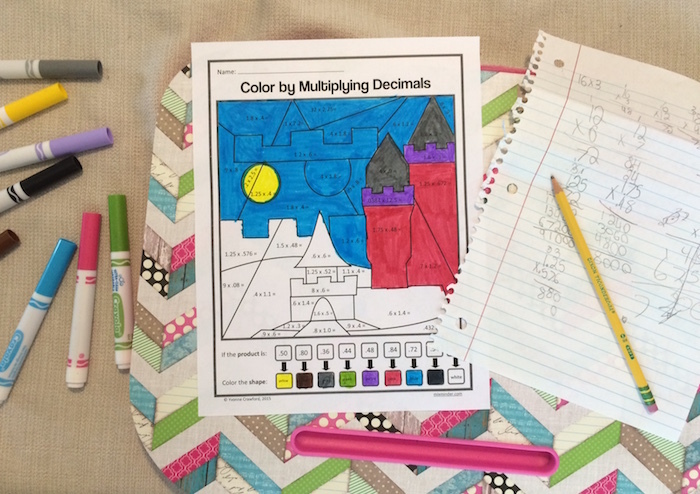 We like to use color by number pages to teach mathematics. Instead of giving a number for a space to color, we might give an addition problem: 2 + 3 =. Then, at the bottom of the page, we might say, “5 = purple“. Kids would solve the problem, then color that space in depending on the color given for the answer. This gets kids practicing their skills with mathematics – addition, subtraction, multiplication, division, working with shapes – while completing a fun art project in the classroom. It’s a best of both worlds scenario. If you’re interested in seeing some of our color by number pages for mathematics, you can fine them here.